For the first time in the history of the event, Skate America came to the Chicago area and the Sears Centre in the suburb of Hoffman Estates. Thirty nine entries from seventeen countries converged on the arena for three days of top class skating to usher in the new season in earnest. Yuko Kavaguti and Alexander Smirnov made a triumphant return to the Grand Prix circuit with a confident performance in their short to Massenet’s “Meditation from Thais” which gave them a comfortable lead of just under seven points going into the free. However, the Russian did not take their foot off the gas and unleashed a high quality arsenal of elements, not least of which was a quadruple salchow throw that garnered them 8.57 points alone. They were foot perfect in their delivery of the routine to Tchaikovsky’s “Manfred Symphony” and racked up a personal best free score of 140 points to claim gold with a total of 209.16. This was Kavaguti and Smirnov’s maiden appearance at Skate America and with their win they have now completed a career slam of the six Grand Prix events. There was a surprise silver for Haven Denney and Brandon Frazier who moved up from third place after the short with their crowd pleasing and technically accomplished “Lion King” free. Flanked by their coaches John Zimmerman and Ingo Steuer, the Americans were clearly thrilled when a score of 122.76 popped up on the screen and this gave them their second personal best of the event. Denney and Frazier’s second place was the best result by an American pairs team at Skate America since 2008. Most pundits had predicted Cheng Peng and Hao Zhang to push the Russians closest, but a rough free skate for Peng, where she fell on both of her solo jumps, relegated the Chinese into third by just over a point. 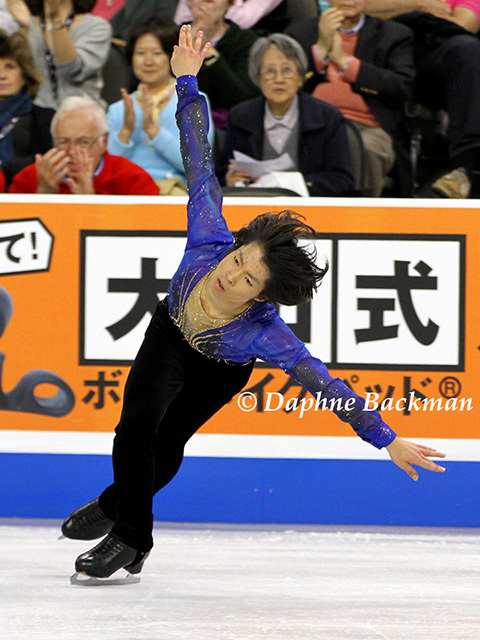 Tatsuki Machida became the first male skater since Timothy Goebel in 2001 to win back to back Skate America titles. The World silver medallist didn’t make a single error during the course of his two programmes at the Sears Centre and was the only man to land all of the quadruple jumps he attempted in both the short and free. In recent years, Japanese male skaters have dominated at Skate America winning eight out of the last ten titles. Local boy Jason Brown nabbed the silver medal despite finishing third in both segments of the competition. The U.S. silver medallists crashed on a triple axel in the short and another one in the free. He did manage to avoid multiple under rotations that littered his protocol at the Nebelhorn Trophy, but without a consistent triple axel and a quad in his armoury he will find it tough to take things to the next level. One skater who had no trouble with landing the big jumps was Nam Nguyen. The World Junior champion climbed up from seventh after the short to third overall when he performed a free that included a quad salchow, two triple axels and six other triples. This is the Canadian’s debut senior season and, based on his outing at Skate America, he will be a force to be reckoned with in the near future. Olympic bronze medallist Denis Ten missed out on the medals and came fourth in both segments of the competition for a fourth place finish. U.S. champion Jeremy Abbott, who many expected to retire at the end of last season, plummetted from second after the short to wind up in fifth. As has become a familiar pattern over the last few years, Russian skaters battled for top honours in the ladies event. Elena Radionova sat in second after the short and, despite some awkward moments at the beginning of her free, she came out and put together a seven triple free to ascend to the gold medal. In doing so, she upgraded from her bronze last season to become the first Russian to win a ladies title at Skate America since 2005. Following three international competitions in a row, it all finally proved to be too much for Elizaveta Tuktamysheva who looked completely spent at the end of her Middle Eastern inspired free. Nevertheless, it was a solid skate for the 2013 European silver medal whose only major mistake was to double a planned triple salchow. The Russian has still left herself with a good chance of qualifying for the Grand Prix Final with her silver medal in Chicago and also walks away with a new personal best short score of 67.41. It wasn’t the medal colour she or her fans were looking for and Gracie Gold ended up over ten points off the silver. The U.S. champion made crucial errors in both of her routines. In the short, she botched her final spin and in the free she fell foul of the new rules that limit the number of times you can repeat double jumps. She received no credit for a double salchow/double toe loop/double toe loop combination (the salchow was originally meant to be a triple) and it was bronze for Gold. Meryl Davis and Charlie White were not on the ice this weekend, but followed the competition from the audience seats and saw the U.S. take the top two steps on the podium. Madison Chock and Evan Bates look more than ready to carry the torch for American ice dancing and won both portions of the competition with ease with new personal bests. American teams have won the dance title at Skate America six consecutive times now. Maia Shibutani and Alex Shibutani had two bronze medals from previous appearances at Skate America and this time improved on that to take silver. The sibling duo have a lot of work to do however if they are to bridge the gap between them and their victorious teammates. The gap at the end of the competition between the two teams was over ten points. One of the only Russian teams to survive from last season took the bronze. Alexandra Stepanova and Ivan Bukin (who is the son of Olympic champion Andrei Bukin) secured third place without any favours being given to them by the technical panel who graded their unusual twizzle sequence Level 1 in both of their routines. The Russians had received Level 4 at Finlandia Trophy for the exact same element just two weeks ago. The Grand Prix caravan moves on this weekend to Kelowna, British Columbia for Skate Canada. This week the German pairs team of Maylin Wende and Daniel Wende announced their retirement from competition. 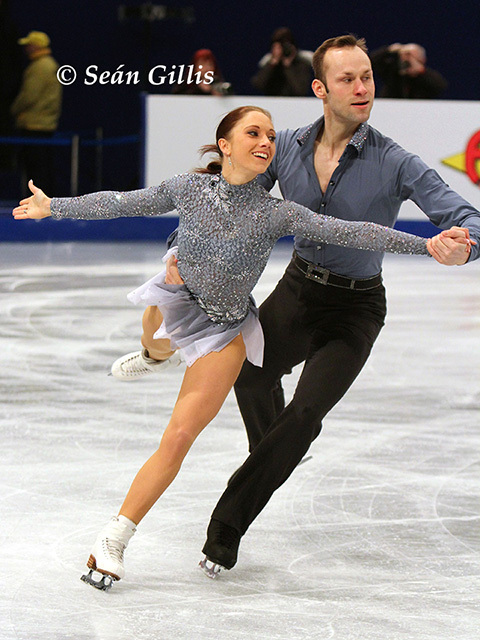 The married couple began skating together in 2008 and represented Germany at Europeans and Worlds that same season. They won the German title twice (2010 and 2012) and internationally one of the highlights of their career was a bronze medal at the 2010 Trophee Eric Bompard Grand Prix. They finished sixth at Europeans twice (2011, 2014) and their best result at Worlds was twelfth (2011). The Germans, who are based in Oberstdorf, plan on becoming coaches. Stephen Carriere (USA) has been added to the entries for Skate Canada. Jin Seo Kim (KOR) is now on the roster for Cup of China. Brooklee Han (AUS) has been added to the Skate Canada roster. Natasha Purich & Andrew Wolfe (CAN) will participate in Cup of China. Jeremy Ten (CAN) has been added to NHK Trophy. Joshua Farris (USA) has withdrawn from Cup of China. Jessica Calalang & Zack Sidhu (USA) have been assigned to Rostelecom Cup.